Here in Toronto it’s election day 2010. We’re selecting our mayor, city councillor, and school trustee for the next four years. Local government is supposed to be about water, sewer, garbage collection, public transit, police, and ambulance services. In our part of the world, approximately half of our property taxes are consumed by the education system – which is why we also elect someone to help ensure that those particular dollars are spent wisely. But the people who’ve been governing Toronto in recent years (and many who’d like to do so starting tomorrow) seem less-than-focused on cost-effective, efficient public services. Rather, they think it’s the city’s job to obsess about the environment. Never mind that Canadians already have, and already pay for, environment ministries at the provincial level (our provinces are the equivalent of US states). Never mind that we have, and already pay for, a massive Ministry of the Environment at the national level. Er, excuse me, we’ve been suffering through a brutal economic recession. Many small companies are hanging on by their fingernails. Tax revenue is down because so many businesses are struggling. Which means city hall is having a problem balancing the budget. Not to mention that our subway system is a joke compared to comparable metropolitan cities abroad. And the mayoral candidate endorsed by the media elites is talking about our supposed right to be a green jobs giant? 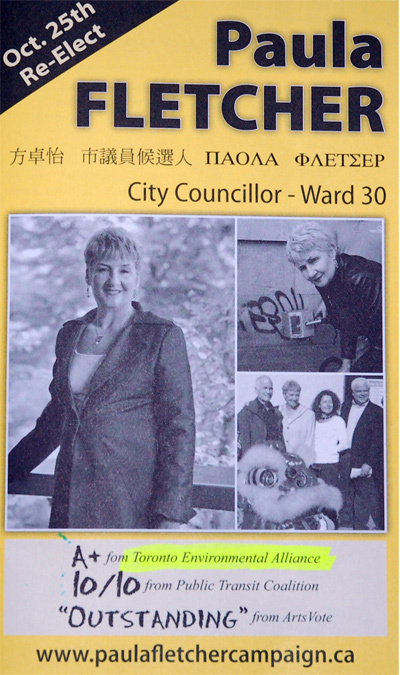 I live in Ward 30, which means my current city councillor is named Paula Fletcher. As Wikipedia explains, she spent five years as head of the Communist Party of Canada, her husband is a labour union luminary, and the labour organization he heads just happens to endorse her current candidacy. Three pieces of Fletcher campaign literature were delivered to my door. It is no exaggeration to say that this woman cannot utter 100 words without mentioning the environment. Exhibit #1 (see the clickable images at the bottom of this post) tells us she has received an A+ rating from the Toronto Environmental Alliance. Not exactly a household name, that organization has 5,000 members – out of a city of 2.5 million. 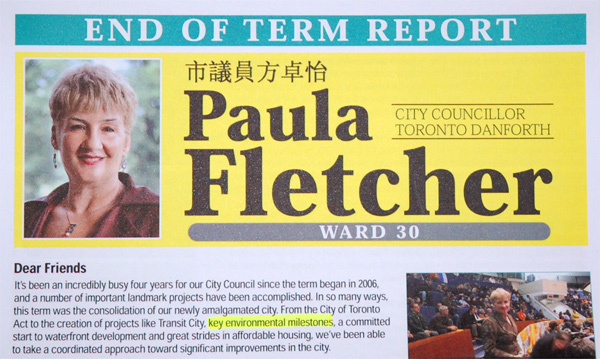 It’s sole focus is “to promote a greener Toronto” [italics added]. But in tough economic times, when cutbacks are unavoidable, should making Toronto greener than it already is be anyone’s concern? According to Exhibit #2, Fletcher has personally already achieved “environmental innovation” in the form of “100 solar thermal panels on local homes.” In other words, the tax dollars of some of our poorest residents are now subsidizing yuppies who’ll only install solar panels if a government program bribes them with a fat cheque. It’s amazing how oblivious people are to the inequitable and unsustainable nature of these programs. Hurray, yippee, and all that. Now could our city leaders please turn their attention to their real mandate? You know, the boring, nitty-gritty stuff that matters to real people who have bills to pay and kids to get to school? This entry was posted on October 25, 2010 by Donna Laframboise in ethical & philosophical and tagged George Smitherman, Paula Fletcher, Toronto (city of).